A familiar Molalla feature is getting some work done and when the dust clears, the results should speak for themselves. The Molalla River BMX track located at 920 Toliver Road is currently undergoing renovation and redesign to give the course a new look and to make it adhere to USA BMX standards and guidelines. "We're renovating the track because our board of directors felt that it was time," said track operator Mike Dahlberg. "What we've decided is that BMX has changed throughout the years as far as track layouts are and how they they're normally built. Now we have decided we need to come up to more current standards to benefit to where riders improve their performance on how they race." The planned renovations are part of a "four phase" vision for the course, according to Dahlberg. Those four phases are: raising the track up from its current level, raising the starting hill to USA BMX regulation height, acquiring new lighting for the course, and reconstructing the concessions and administration building. The first part of the renovation is simply help with track upkeep and maintenance. Raising the track up off of its existing grade and adding more dirt to the features would help with drainage during the rainy seasons and help prevent obstacle erosion. The second phase is pretty straightforward: get the starting hill up to code. "Our starting hill is not at regulation height," Dahlberg said. "Regulation height is a three meter hill. The city has been nice enough to allow us to build a prestaging area over in the cycling fence. So what we need to do is work with the city and the public works director and be able to somehow come up with something to somehow raise that start hill to the standard height." The third part of the renovation is to upgrade the existing lighting on the track. Doing so will allow the course to operate later into the evenings, and not be limited to daylight. This will allow for more events to be held in Molalla. The final phase of rebuilding the concessions building will be last. According to Dahlberg, the costs will be in the tens of thousands. $6,000 for the dirt lift and track redesign, $10,000 for the new lighting, and $24,000 for the new building. Because the BMX course is a nonprofit, the funds will be coming from donations from individuals and businesses. "There are a lot of little pieces to put this together for a nonprofit," Dahlberg said. "It's not one or two people, this is a huge community that's coming together. They know this person has this, this person owns this, that person can help us out. We're able to piecemeal this all together because when it comes down to it it's all about the kids and helping them, especially in this sport." If the renovations pan out the way Dahlberg expects, the course, which is currently closed, should be up and running again by late May. Of course, that's weather and resource permitting. "The ultimate goal is to have the track rebuild done by about the third or fourth week of May, weather dependent," Dahlberg said. "But if there are some unforeseen things, such as getting the track building company there on time, or spotty breaks in the weather, we'll take that dirt, not necessarily have it stacked on the track, but have it off to the side so the track can remain open. But right now we have the track closed because of the construction because of the construction equipment that is out there because it's too much of a safety issue." 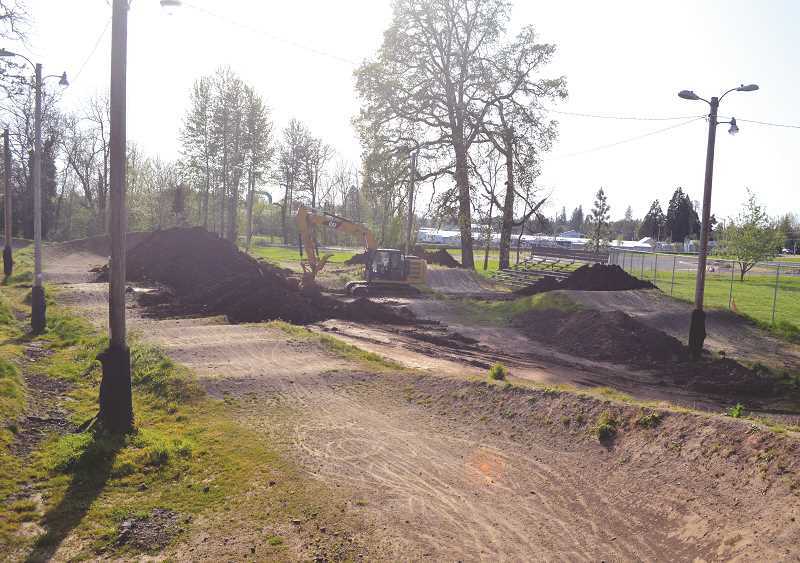 Dahlberg hopes that when the redesign and reconstruction are completed, the new and improved course will draw riders from all over the BMX region for large races that will be held in Molalla. "We have the Governors Cup race that's coming up, that's going to be in July 21st and 22nd," Dahlberg said. "The big one for our track is going to be state finals and that's going to be August 18th and 19th. This will be the third year in a row. It's a huge event, and the thing this rebuild is going to do is draw riders from Washington. It could draw other riders possibly from other states." Dahlberg, who got into the sport five years ago when his sons began racing, believes that everyone should come out and join the BMX community. "Everybody comes out, everybody has a smile on their face, everybody cheers," Dahlberg said. "A rider wrecks and everybody claps and cheers them on. Say your son is going up against another boy and that's your son's main competition. Your sons tire pops because it ran over something here in the gravel, but that dad doesn't laugh. He's like, 'I'm going to get a tube, hold on!' Everyone jumps in and helps one another. It's amazing. People should come out for the atmosphere. It's literally addictive. It's energetic and it's amazing. It doesn't matter which track you go to."